This year we have 5 places on the Nightrider charity cycle ride, taking place throughout the night, Nightrider is a charity ride which is all about having fun, seeing the sights and taking on a personal challenge. You can choose from a 50km or 100km route in and around the Wirral and Liverpool. Explore the city’s top sights, latest attractions, famous landmarks and discover some lesser well-known treasures. Whether you’re cycling on your own, with your friends, family or work colleagues, it is definitely a different kind of Saturday night! It is not a timed ride or a race, it is all about having a good time and cycling together. Enjoy the sights, take photos, support each other and help to raise funds for East Cheshire Hospice! some world-famous landmarks: Liverpool’s historic waterfront, Albert Dock, Echo Arena, Cavern Club, Empire Theatre, Penny Lane, Strawberry Fields, Knotty Ash, Anfield Stadium (Liverpool FC) and Goodison Park (Everton FC). Full support, back up and regular break stops are provided throughout the night, along with a well-earned breakfast and medal at the finish. 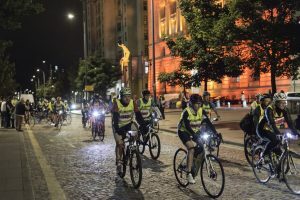 Enjoy cycling past the many sights of Liverpool and the Wirral in this unique charity bike ride at night. The route is fully sign-posted. You can cycle at your own pace and follow the signs. GPS route will also be released. Choice of routes – 100km, 50km Wirral loop or 50km Liverpool city loop. Amazing atmosphere with hundreds of cyclists riding together, raising funds. Great event to do with friends or work colleagues. Why not get a team together? Nightrider is organised by leading charity challenge company Classic Challenge who have been organising challenge events for more than twenty-five years. If you’re looking for a different and enjoyable challenge then this is for you! You should be confident in cycling alongside traffic. Some roads are busy even at night. The route is mainly on quieter roads, but it does take in some of Liverpool’s lively spots which will be busy with the public and vehicles. This event is not a race and is not timed and we encourage people to cycle responsibly. Most people complete the 100km route in 6-8 hours. The maximum time permitted is 10 hours. You should be prepared to put in some training prior to the event – it is a challenge and you will need to be able to cycle 50km /100km. We therefore do not recommend this event for beginner riders. Sound like the event for you? 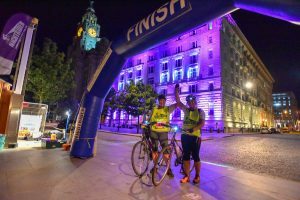 We’d love you to join the East Cheshire Hospice Nightrider Liverpool team on one of our limited Charity Places. You will need to pay a registration fee and we ask to you commit to raising £175 minimum sponsorship for us. We’ll give you lots of support, help and advice to set you on the way to fundraising success. To secure your place in Nightrider please click below to complete the short registration form and pay your registration fee. You can select which distance you would like to register for. We’ll then be in touch to welcome you to the team and support you on your way. New for 2019 – the earlier you register for Nightrider, the more you save on your Registration Fee! Have a read through of the Frequently Asked Question document here if you’d like any more information. Full terms and conditions of Nightrider can be found here.